Electro-acupuncture is acupuncture with mild electric stimulation. While the procedure and process is similar to acupuncture, electroacupuncture has a profound effect on the therapy. Electro-acupuncture is a powerful tool used to enhance the already powerful the pain relieving and anti-inflammatory aspects of acupuncture. In many patients it is the key to improvement. I most often use electro-acupuncture for chronic pain such as back pain, neck pain, chronic pelvic pain syndrome, and others. But it can also be used to help people quit smoking, addictions, and reduce inflammation. The pain relief with electro-acupuncture can be so dramatic it has been used for certain types of surgery in China. What is an Electroacupuncture treatment like? 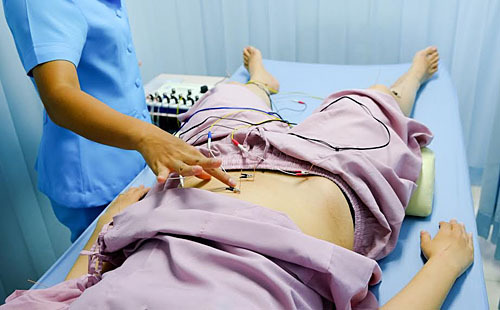 Electroacupuncture is very safe and comfortable for the patient. Generally the patient will feel a small tapping or tingling where at the location of the electric stimulation. The muscles in the area sometimes will twitch a little. The electro-acupuncture machine which I use utilizes microampere which causes less muscular twitching. The three main factors in the success of electroacupuncture treatment are acupuncture points which are stimulated, the frequency of the electric stimulation, and time of the treatment. Which Acupuncture points to stimulate? The first is what points to put the leads on. Each lead has 2 clips. You can put them on two acupuncture points that are relatively close together if you want to focus pain and inflammation in a specific region or muscle. Or you can put them farther away if you want to increase circulation in the channels. It is important to place the leads ipsilaterally, that is only one side of the body and not cross the spine. Specific acupuncture points, such as ST 36, GB 34, and GB 30 have a profound effect when stimulated. What are the best frequencies for Electro-acupuncture stimulation? The frequency of the electric stimuation is very important to the successful treatment. Specific frequencies, such as 2hz, 10hz, and 100hz have been shown to stimulate to release specific natural painkillers called endogenous opiates or endorphins. 2hz stimulates the release enkephalin, beta-endorphin and endomorphin while 100 hz has been shown to release dynorphin. (3) Lower frequencies of 2hz and 10hz have been shown to decrease both pain and inflammation (4). How long is the electroacupuncture treatment? The electroacupuncture will stay on from 15-20 minutes. It is important to not go much longer than 20 minutes as this is the most optimal time for stimulation. For acute injuries stimulation is less time, about 10-15 minutes. When we begin the treatment I will slowly increase the electroacupuncture until you feel it. Over a few minutes you become used to the feeling. After ten minutes, I will increase the stimulation again until you feel it. Electroacupuncture can treat a wide range of pain conditions. If you are not sure if electro-acupuncture is right for you please call us. We can discuss your condition and what treatment is the best course. 1. Zhang R1, Lao L, Ren K, Berman BM. <a href=”http://www.ncbi.nlm.nih.gov/pubmed/24322588″>Mechanisms of acupuncture-electroacupuncture on persistent pain</a>. Anesthesiology. 2014 Feb;120(2):482-503. 2. Electroacupuncture reduces Sepsis in Mice. <a href=”http://www.nih.gov/researchmatters/march2014/03102014sepsis.htm”>NIH Research Matters </a>Website. Accessed 1/20/2014. 3. Han JS. Acupuncture and endorphins. Neurosci Lett. 2004 May 6;361(1-3):258-61.